Grumman’s F9F Panther marks one of the earliest jet-powered single engine aircraft to be used exclusively from a naval aircraft carrier. 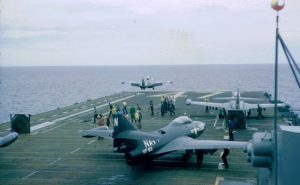 Up until the F9F’s initial release in 1949, the United States Navy predominantly depended upon propeller fighter airplanes to protect the naval carrier group. Because it was an early version of a jet aircraft made by Grumman, it featured straight wings — a feature that would not be seen again in jet fighter aircraft. 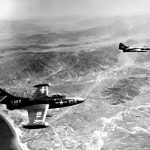 Despite the initial design being an antiquated carry-over from an era of propeller-driven airplanes, the F9F proved itself as a very dependable, combat-ready jet aircraft. This design would later be developed into the F-9 Cougar. 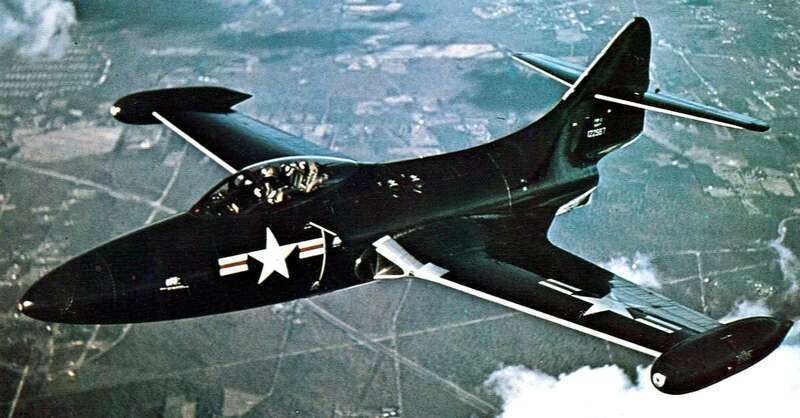 The F-9 Cougar is a swept-wing variant of the F9F Panther. 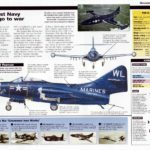 The F9F Panther was one of the last jet fighters of that era to have guns installed. 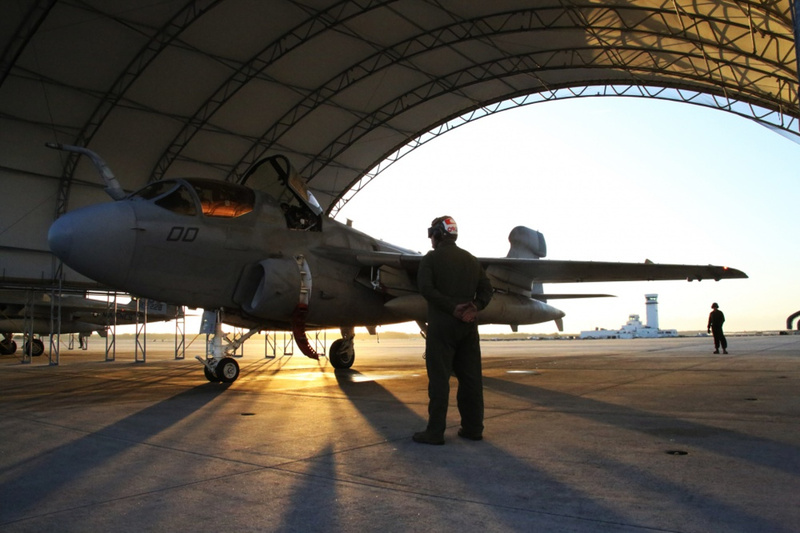 It was a predecessor of the last great American gunfighter, the F-8U Crusader. 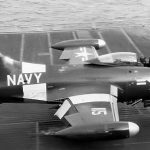 As for the F9F’s armament, it included hard points along the wing for air-to-air and air-to-surface missiles as well as four emplaced 20 mm (0.79 in) AN/M3 cannons. Each cannon had 190 rounds, giving the F9F Panther a total capacity of 760 rounds. 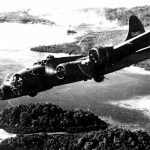 This was devastating against both ground forces and enemy jet fighters. 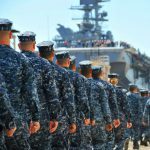 One of the greatest assets the American aviation fleet had was the sheer capability of its pilots. 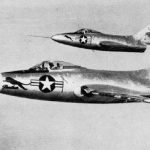 Evolving from a generation of pilots who fought tooth-and-nail against initially superior Imperial Japanese fighter airplanes, this next generation of jet fighter pilots proved to be extremely capable and agile in the face of a quickly evolving air war. By the mid 1950s, air superiority was absolutely required to ensure that ground forces in Korea could defend their positions or advance. 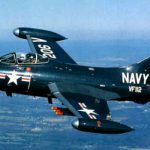 This required a great sacrifice on behalf of both F9F Panther pilots as well as other air superiority fighters as they were facing an untested, new generation of Soviet-made jet fighters. Gun camera photo taken by a United States Navy F9F Panther fighter from the aircraft carrier USS Leyte (CV-32) as its pilot shoots down a Chinese MiG-15 over North Korea near the Yalu River during the Korean War (1950-1953). The MiG-15 proved to be a capable-enough aircraft that made traditional propeller fighters utterly obsolete. 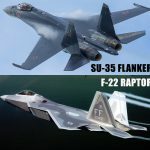 To answer this development, the United States Air Force, Navy, and Marine Corps predominantly depended upon the F-2H Banshee, F9F Panther, and the F-94 Starfire. By any modern or conventional comparison, the United States’ jet-powered all-weather fleet was extremely short-handed technologically. 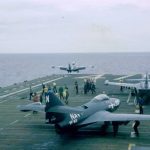 Yet, with the F9F Panther in particular, the pilots and ground crews ultimately made the aircraft what it was — extremely effective against Soviet air aggression. 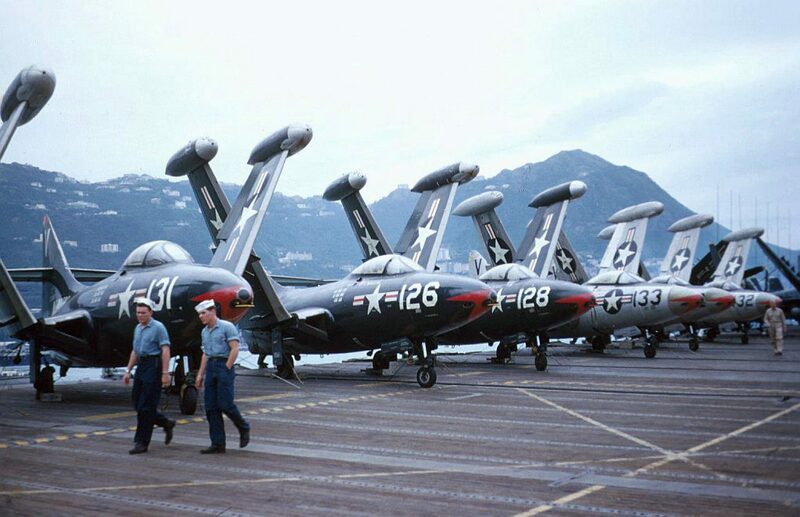 Despite having a brief operational tour of duty with the Blue Angels, the original F-9 never saw actual combat. The only version to briefly engage was a trainer F-9 (TF-9J) in the Vietnam War. 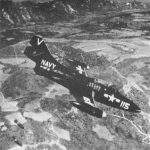 Its younger predecessor, the F9F Panther, saw extensive use during the Korean War with the United States Marine Corps and the United States Navy. In fact, several notable pilots of the F9F include future NASA astronauts Neil Armstrong and John Glenn. 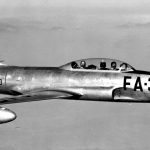 The F9F was also the only jet fighter to ever score successive kills against the MiG-15 and Yak-9. They proved to be a very reliable, rugged, and capable jet fighter for forward air control and close air support. The majority of the fleet was replaced by the F-8U Crusader in 1958. 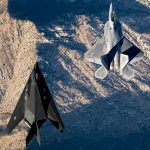 Quite a few would return state-side to act as trainers for a new generation of jet fighter pilots and also be used in the Air National Guard. 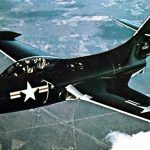 The F9F Panther was powered by a single Pratt & Whitney J42-P-6/P-8 turbojet. The J42-P-6 and P-8s could produce up to 5,950 lb-ft of thrust. At this point in history, the jet engines still used water injection.